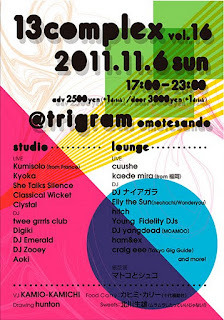 Tokyo Gig Guide presents FARM PARTY #7 this Saturday November 5th! This Saturday, come to the 7th Farm Party gig organised by Tokyo Gig Guide, this time held at Dynamo, a fun little skater bar near Koenji station. I'm excited about the diverse lineup of live music - we have noisy new-wave disco-punk band Jebiotto!, all-girl psychedelic trio Fancy Numnum, international avant-pop band Abikyokan, and mutant sci-fi lo-fi duo Living Astro. DJs Grant McGaheran, Timebred, craig eee and more will be playing danceable oddities at the start and end. Doors open at 7:00 and live music should be finished by 11:00, but from then the DJs will keep you dancing for as long as you'd like to stay. As usual with Farm Party, my video collages will be projected throughout the night. Oh, and it only costs 500 yen! Place: Dynamo (Koenji). Asahi building 1F, Koenji-Kita 3-1-1. DJs: Timebred, Grant McGaheran, craig eee, more? On Sunday November 6th, Eri Makino is planning a not-to-be-missed gig with an impressive lineup of electronic and indie bands, performers and DJs. One of the performers will be Kumisolo, a Paris-based electro pop artist you may know from The Konki Duet and collaborations with the likes of Toog, Momus and O.Lamm. 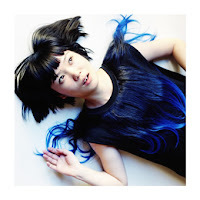 You will also get to see Kyoka, an experimental pop artist who counts Ryuichi Sakamoto and Mike Watt among her fans. 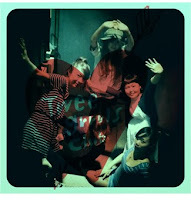 On the same (Studio) stage you can see She Talks Silence, a fashionable indiepop trio, as well as Classical Wicket and CRYSTAL. 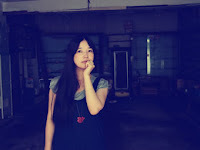 Over on the other (Lounge) stage, performing live will be cuushe with her beautiful vocals and electronics, and the ambient sounds of Kaede Mira. Over 12 DJs will also play throughout the event including the twee grrrls club all-girl indie-pop collective, French party DJ Digiki, DJ Emerald (Eri Makino's DJ alter-ego), Elly the Sun from Neohachi and even me (craig eee). Make sure you don't miss matocotoshuco, a kamishibai picture storyteller who is always a highlight of Eri's events. Curry and sweets and all sorts of other good stuff will also be on offer. 13 complex vol. 16 goes from 5:00 to 11:00 p.m at Trigram Aoyama near Omotesando station. 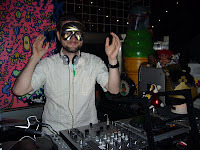 It's 2500yen (+ drink) advance (email [email protected]) or 3000yen (+ drink) on the day.